NEWTON – In 2016, Hanover’s Thomas Atkins enjoyed a standout performance in a state championship game victory versus Dighton. Last year, Atkins was unable to play in the title versus Hodgeman County because of non-injury related reasons. This season, Atkins delivered an electrifying performance in a 58-50 Hanover victory against Osborne in the Eight-Man, Division II state game Saturday at Newton’s Fischer Field. The 108 combined points set a record for highest combined output in eight-man title annals. Atkins collected eight catches for 148 yards and TD receptions of 20 and 47 yards. He also had a 17-yard rush and returned a kickoff 67 yards for a score. Hanover led 12-0 after the first quarter and 32-12 at intermission before Osborne delivered a thrilling comeback. The Wildcats took advantage of three first half turnovers, including two lost fumbles. Last year, Hanover defeated Hodgeman County, 54-48, and held on as the Longhorns had a big comeback. That contest first broke the eight-man championship collective scoring mark that had stood since ’78. Hanover’s senior class finished 50-1, captured its third straight title and bumped its winning streak to 38 contests, longest in eight-man state history since the 1980s. Hanover finished 13-0, and Osborne went 11-2. Osborne had won Division II crowns in ’13 and ’16. Wildcat coach Matt Heuer captured his fifth state title. All-time, only Hanston’s Jerry Slaton has more among eight-man coaches with six. With 4 minutes, 21 seconds left, the Bulldogs closed to 52-50, its closest deficit since the first quarter. Before Hanover’s offense took the field, Heuer had a long talk with senior quarterback Daiken Stallbaumer. After a two-yard Stallbaumer rush, Hanover called “Tommy iso,” a play it used multiple times Saturday. Atkins was generally matched up against freshman defensive back Mason Schurr. Stallbaumer turned and threw a quick pass down the line of scrimmage to Atkins. He had 1-on-1 with the cornerback, gained separation, ran down the sideline, broke a tackle and scored from 45 yards. Hanover missed the two-point conversion at the 3:25 mark for a 58-50 advantage. “Backside Tommy iso, just get it into his hands and see what he can do with it,” Atkins said. Osborne took over at its own 15-yard line. Hanover moved Bruna, a senior all-state linebacker, to the defensive line at defensive end and nose guard. It marked the first time he’d played defensive end all year. “They wanted me to try to shut them down and bringing it inside instead of outside, because they kept hitting our outside pretty hard,” Bruna said. Two rushes netted six yards. Then, Osborne senior quarterback Darnell Holloway threw low. Senior Kade Miller caught the ball, but it was ruled to have hit the ground. On the next play, Hanover stopped Holloway for three yards on a tackle from sophomore Colin Jueneman. Osborne had no timeouts left, and Hanover was able to run out the clock. On 4th-and-1 from the Bulldog 15, Bruna had a pitch left, broke a tackle and gained the first down. He finished with 16 carries for 112 yards and a TD. “I was going to do everything I could to get there,” Bruna said. For Hanover, senior quarterback Daiken Stallbaumer finished 12 of 13 passing for 203 yards and three scores, two to Atkins and one to senior Pete Peters. Early, Osborne closed the game to 12-6 when Hanover called “Tommy iso.” Atkins took a quick pass on the right, ran all the way across the field, and down the left sideline for a 46-yard play. Stallbaumer scored on the next play from five yards out. He delivered 14 carries for 108 yards and three TDs. After Osborne sliced the margin to 20-12, Atkins immediately returned the kickoff 67 yards for a score and 26-12 advantage. 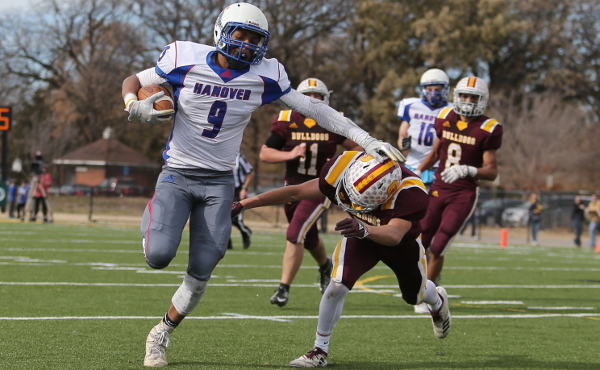 Hanover finished 2 of 9 on two-point conversions. In the second half, Hanover led 52-42 when Osborne forced the game’s first and only punt with 6 minutes, 21 seconds left in the contest. Heuer said “this is a totally different ball game” if Hanover converted more two-point conversions. Osborne closed the game to two points on a 10-yard run from Darnell Holloway, and set the stage for Atkins’ final play and finish.